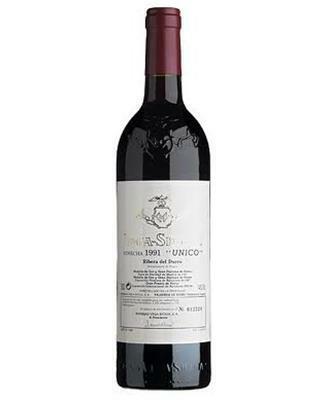 From Vega Sicilia (Ribera del Duero), we received this 2005 Vega Sicilia Único ($332.64), a red wine based on the best tempranillo, cabernet sauvignon and tinto fino from 2005 and comes with an alcohol content of 14%. The 2005 Vega Sicilia Único is the ideal red to combine with foie and bar-b-q. According to Uvinum users, this red wine earns 4 out of 5 points while renowned wine experts rate it as follows: robert parker: 96 and peñín: 95. - View: intense ripe cherry red, bright edge. - Nose: very pure and elegant, dark berry, blackberry, Granada and a touch of orange blossom. - Mouth: a pure and quite acidic entrance and a touch of spice, notes of blackberry, sloe, dates and citrus peel, a silky smooth texture in the final. GRAPES: Tempranillo 94% and 6% Cabernet Sauvignon. AGEING: more than six years in barrels of American and French oak barrels of 225 liters and 20,000 liters capacity. WINE PAIRING: Roasted red meat, big game, red meat grilled, roasted lamb, small game, Iberian ham. Neal Martin had already tasted the 2005 Único in 2012, before I joined The Wine Advocate, but then they released 2007 and 2008 before and the 2005 has been kept until now, as they thought the vintage required some more time in bottle. It's mostly Tempranillo with some 6% Cabernet Sauvignon, fermented with indigenous yeasts in oak vats and aged for almost six years in 225-liter French and American oak barrels and 20,000-liter oak vats. The extra time in bottle has helped the wine to develop its bouquet, and it feels very aromatic and open, with the classical Vega Sicilia perfume of yesteryear, earthy, leafy and spicy, even if they wine was kept because of its power. It's still powerful, but at the same time it's elegant and has a polished mouthfeel and fine-grained tannins. 93,545 bottles, 2,391 magnums, 146 double magnums and six imperials produced. It was bottled in June 2011. Next year they will release the 2006, and the following vintage to be released in 2019, will be 2009. Further than that they don't know, as the only newer vintage in bottle today is 2010 and they are about to bottle 2011 now. I opened this 2005 with a friend. I was impressed by its colour. Tobacco aromas. Not the sweetest wine, but kind of. This wine improved the meal. The best of for drinking in good company. The wine is of a red ruby colour, having reddish brown edges. It has aromas that reminded me of white roses. It tasted like a mouth-watering candy. Red wine aged for 64 months in new barrels and used. 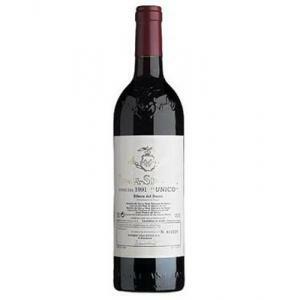 If you want to buy 2005 Vega Sicilia Único, at Uvinum you will find the best prices for Ribera del Duero red wine. At Uvinum, at the best price, quick and 100% safe via any device. We have over 59.000 products for sale which makes us leaders in the sector of selling wine, beer, and spirits in Europe with a community of more than 38.000 customers who enjoy Uvinum.